Once upon a time, the King of Hungary, called Geza II (1141-1162), had a problem. His kingdom needed defending, especially in the south and east, in what is now Romania. It was the Middle Ages, and everybody was fighting over territory. So he sent ethnic Germans to settle in Transylvania, and they continued to move there until the end of the 13th century. These colonists became known as Saxons. In order to defend themselves against attack, especially from the Ottomans and the Tatars, they built fortifications. In some cases the fortification centered around a castle or even an entire town, but in many smaller villages, they instead added defenses to their churches. 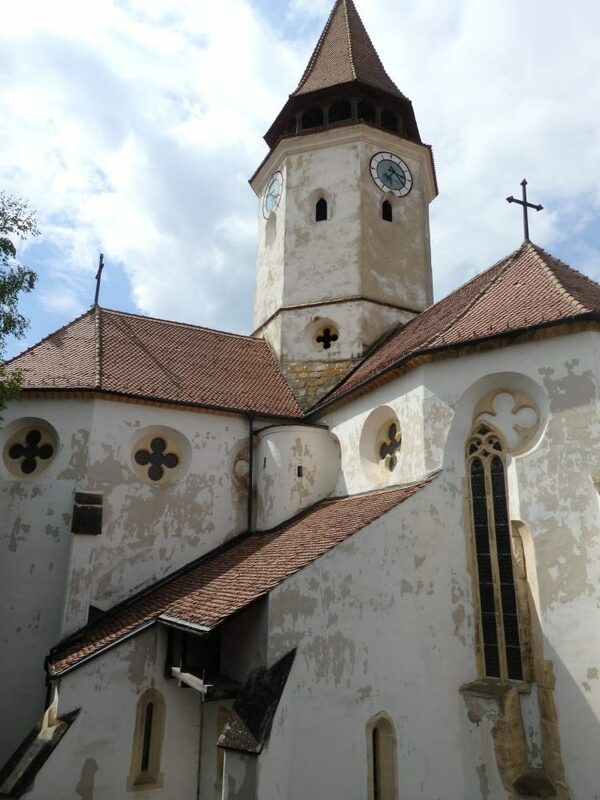 The resulting structures – about 150 of them remain – are today called fortified churches, and they are scattered across Transylvania. Seven of them together make up a UNESCO World Heritage Site. I posted last week about Dracula’s castle, a popular tourist destination. 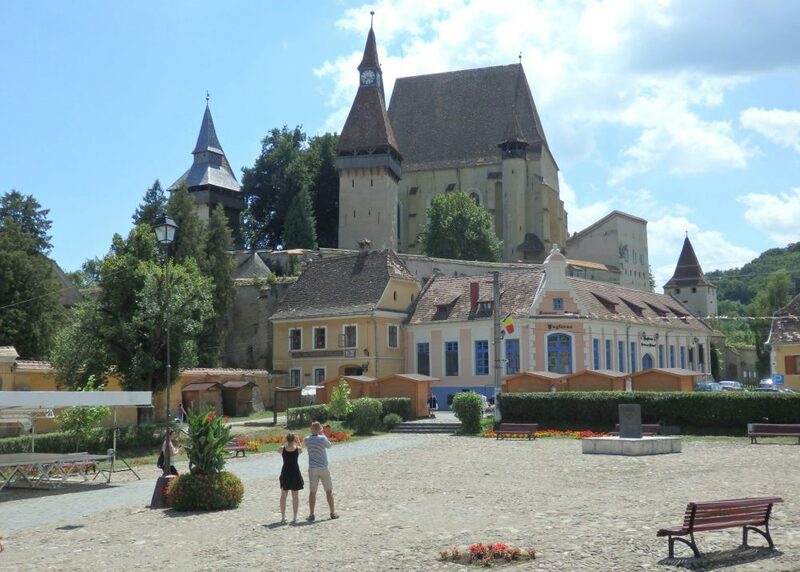 But when my husband and I took our road trip to Romania this summer, we were much more interested in visiting the seven fortified churches in the UNESCO designation. 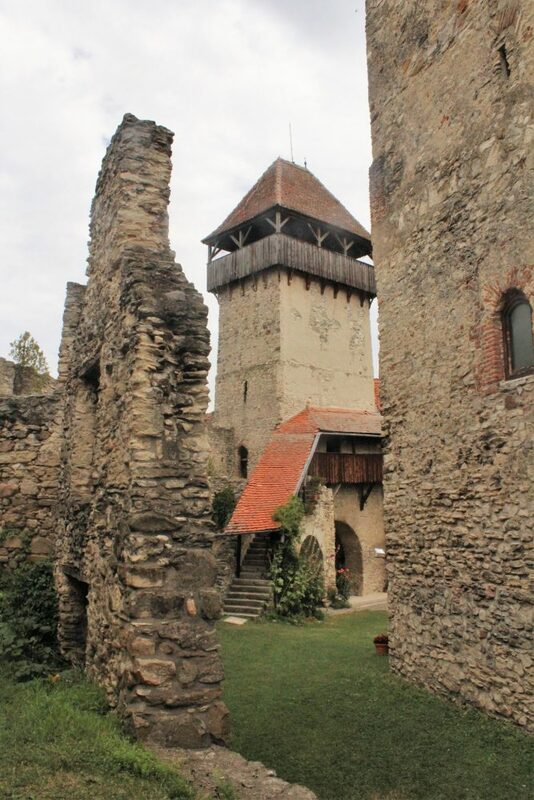 This was the first fortified church we visited, yet it was more like a castle than a fortified church. It has a traditional keep in the center, built in the late 13th century, and perimeter walls and gates built of stone. When we arrived, it was closed, but a sign on the gate gave a phone number. When I called, I was told that someone would be there in ten minutes. Waiting, we watched village life pass by in the form of a man driving a horse and cart, and a group of children stared at us and asked for money before they wandered away again. Soon, a woman on a bike arrived and let us in. When the noble family that owned Câlnic castle left in 1430, they sold it to the local community, which converted it into a more traditional Saxon village fortification. They added the church (or replaced an older one) in the 15th century and made other changes to increase its defensibility. In this picture you can see a piece of a ruined interior wall, one of the exterior wall towers, and, to the right, the keep. Photo courtesy of Albert Smith. Today it is a lovely space, sometimes used for events. The church is painted inside in the traditional Transylvanian flowery style. 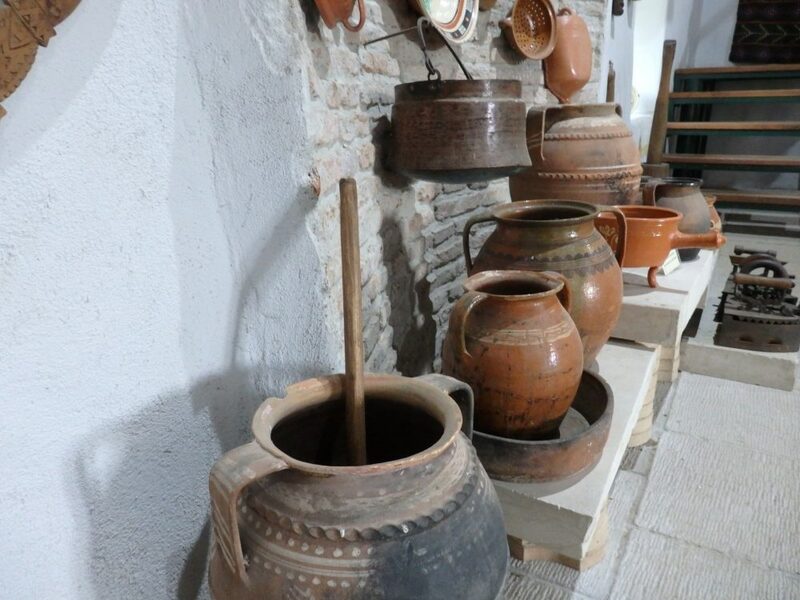 In the keep, the village has established a small museum, with a hodgepodge of articles meant to illustrate aspects of local village life. Prejmer was a favorite for us, and it takes a longer visit than the others because there is so much to explore. The Order of the Teutonic Knights started to build the church in 1218, but the Cistercian monks finished it after the Teutonic Knights were expelled in 1225. It was fortified starting in the 15th century. After entering through an arched passage, complete with portcullis, we emerged into a charming interior courtyard, edged with a four-story structure lining the fortification’s outer walls. The structure is dotted with doorways and windows and laced with stairways and external corridors in dark wood. The more than 270 rooms could be used for shelter or storage in case of attack or siege. The church, a classically Gothic style, is protected inside these walls. We were allowed to climb the stairs and peer into many of the rooms, a few of which have furnishings or items on display. We could also walk the defensive space above the rooms, just under the roof: a tunnel of sorts all the way around the inside of the wall, which would have allowed soldiers to shoot through openings down toward anyone who dared attack. 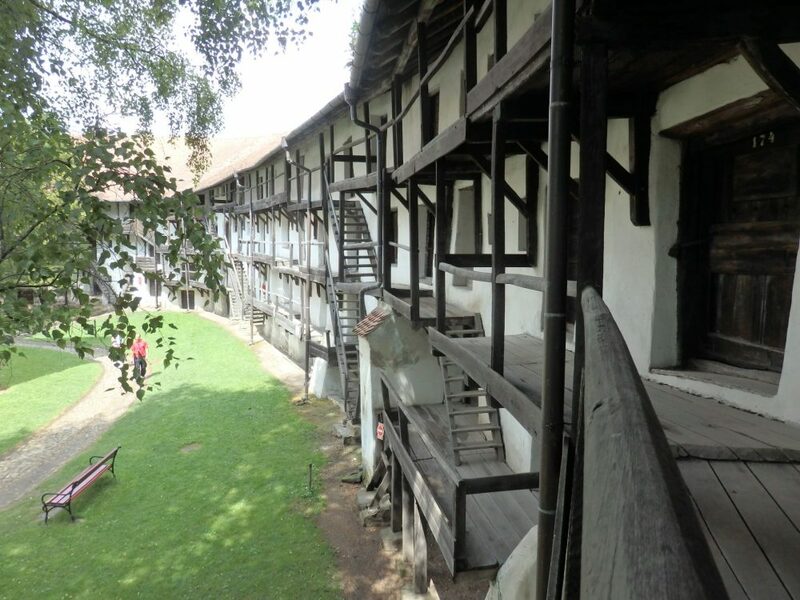 A view of some of the exterior walkways and rooms inside the defensive wall of Prejmer fortified church. The fortified church at Biertan is very prettily placed, with houses huddled up against the outer defensive walls. The church inside dates from the 15th century, so its style is late Gothic, with some decorations that are more Renaissance style. Biertan’s church has fortifications of its own, which you can see clearly on the church tower: it doubled as a steeple and a lookout point. The church sits on a hill above the village, allowing defenders to see approaching enemies from a distance. Not long after the church was built, the concentric walls were added, along with several tall lookout towers. The fortified church at Darjiu is Unitarian, unlike most of the others, which are Lutheran. This is because it’s the only one in the UNESCO collection that didn’t protect a Saxon village. The people here were Székely: Hungarians. I suspect that Darjiu was a smaller or poorer village. The defensive walls around the church are quite low, and the towers don’t loom nearly as high as at some of the others. Visitors can climb the church tower here too, and get a good view of the surrounding country. The main defensive structure at the Saschiz fortified church is the rather ornate tower dating to about 1500. It’s seven stories tall now, but was originally only five. Like the towers of many of the fortified churches, it served both as a belltower and a guard post. It even has arrow loops to shoot through. Saschiz fortified church and the taller and fancier defensive tower are in the center of this view. It’s not clear whether Saschiz ever had defensive walls, or if the tower was considered enough. The church next to the tower is Gothic, but less elaborately decorated than some of the others. Perhaps the reason it needed less defending was the medieval castle that used to top the hill above the village. Today the ruins are not maintained in any way, but an informal footpath leads up there. Completely overgrown, you can spot where the keep used to be – now just a small, overgrown rise – inside the ruined walls with guard towers partially still standing. I recorded the Facebook Live video below at this castle. Please pardon the quality; Facebook Live does not lend itself to editing. Like Darjiu, Valea Viilor’s walls are not very high: in this case a series of arches with rooms and an external walkway one flight up. Like Saschiz, it looks like the church tower itself was Valea Viilor’s primary defensive structure. The defensive walls at Valea Viilor fortified church, with one of the guard towers. We climbed the church tower: a scary thing for me to do, given my fear of heights. From the top, we could survey the surrounding village and the hills beyond it, as well as peer down – to the extent that I dared – at the walls below. From that angle, they don’t look like they’d be very effective in an attack. The church inside is not highly decorated, but has the typical Gothic traits of all of these fortified churches. To get to Viscri involves driving through a village on an unpaved, partially cobbled road. The church is a particularly photogenic one, perched on a small hill. Its whitewashed walls topped with towers give the impression of a small castle. 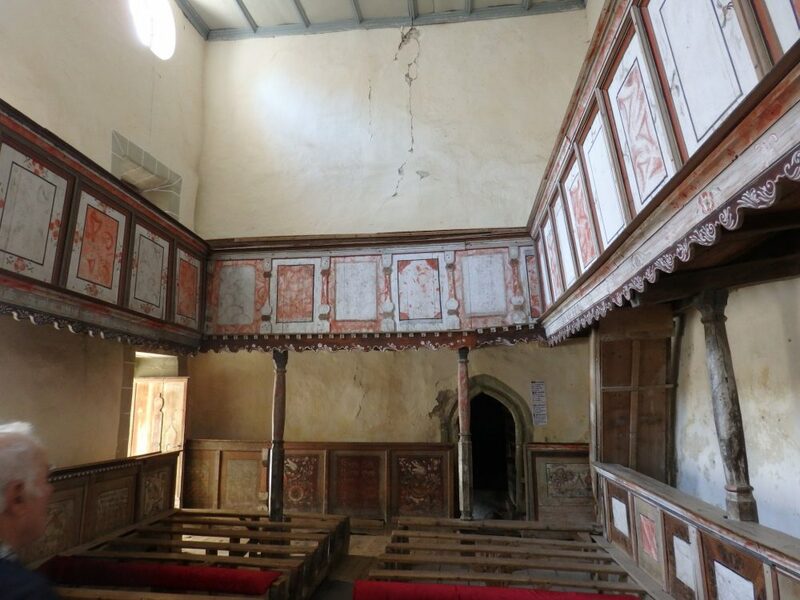 The church inside boasts rather primitive paintings covering the woodwork of the side and upper galleries. Some of it was clearly intended as trompe l’oeil marble, but isn’t very successful. The result is somehow charming. Again these walls are not very tall, but because they circle the top of a hill, they afford a bigger view than their size would suggest. At the top of the church’s squat, square, fortified tower, we could see far across the village to the rolling hills and farmland beyond. 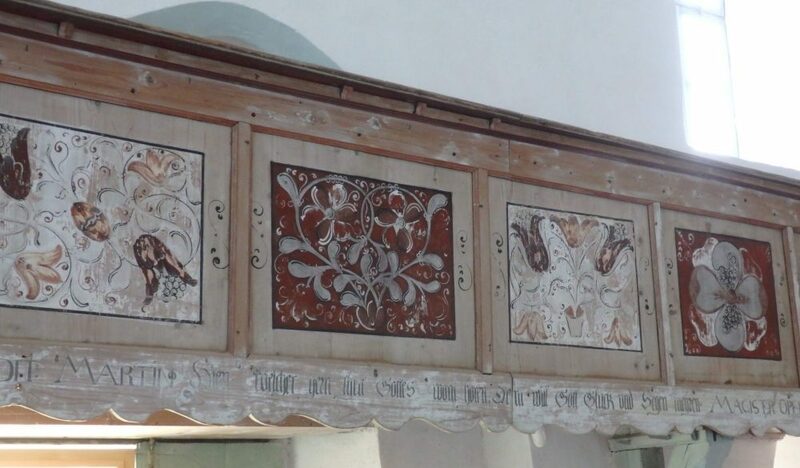 Viscri also includes a museum, again displaying odds and ends of daily life in rural Saxon Romania: traditional clothing, furniture, embroidery, ceramics, and so forth. This, by the way, was the only one of the fortified churches where we saw souvenir stalls set up in the village outside. We didn’t actually plan to visit Bunesti; we just happened upon it. It’s not one of the UNESCO-listed churches, but it is one of an additional group of about 15 that are supported by European Union funds. Bunesti church on the left, with fortifications on the right. Yet Bunesti was just as interesting as the UNESCO ones. Its church (late 13th century Romanesque) has an ornate carved altar. It’s quite tall inside, and the end opposite the altar holds two stories of balconies, intricately painted in an only slightly less primitive style than the paintings at the smaller church in Viscri. It was fortified later, in about 1500. The walls around the church date to the 14th century, and have rooms along the inside for storage. Again, they are quite low. And again, we could climb the tower of the church to see the view. In this case the church isn’t on much of a hill, yet the view from the top would still allow for plenty of warning. We stopped at two more fortified churches just because we happened to pass them. One was in very bad condition. The walls were propped up with wooden beams, and the gate was locked up. 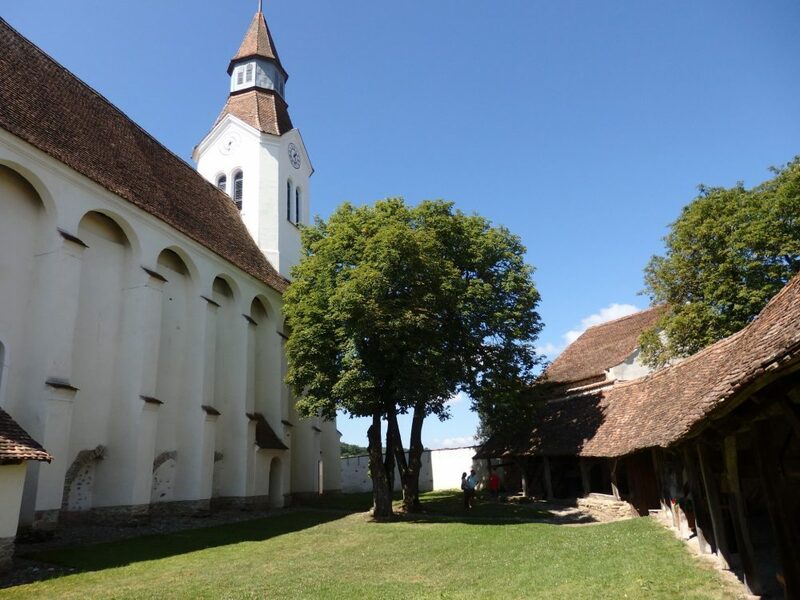 The other was the fortified church in Târnave. The church is simple inside, with less decoration than the others we saw. The tower of the church is simple and strong, without the open guard area at the top: only a few windows. The walls around the church are also simpler than the other fortified churches we visited: just walls with occasional square guard towers, but without a space to walk around the walls, and without storage areas. We loved visiting all of these, and we did it in two days, without feeling rushed. That’s because each one, except perhaps Prejmer, will only take about a half hour to an hour of your time, depending on whether you climb all available towers and spend time in museums. (The small museums that many of these churches have are all very similar, so we stopped doing more than strolling quickly through them.) An added bonus is that there were very few other tourists at any of them, even though we visited at the end of July. What took us the most time was driving between them. If you don’t feel the need to visit them all, I’d suggest Prejmer first of all, and Viscri in second place. This image is perfect for pinning! 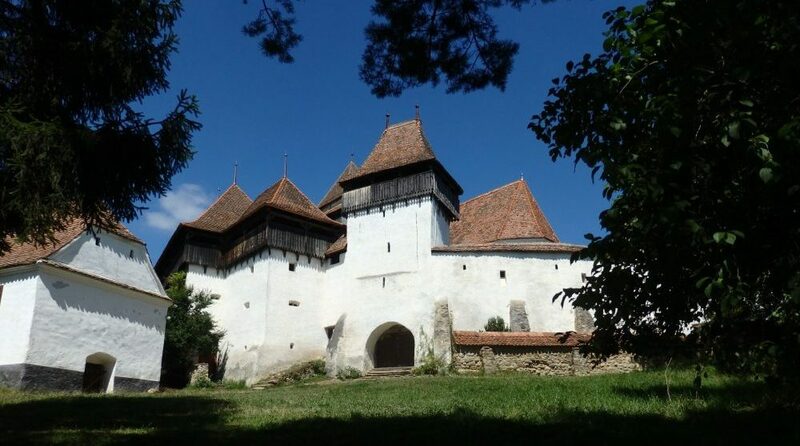 Details: Go to the UNESCO list for the details on the fortified churches. 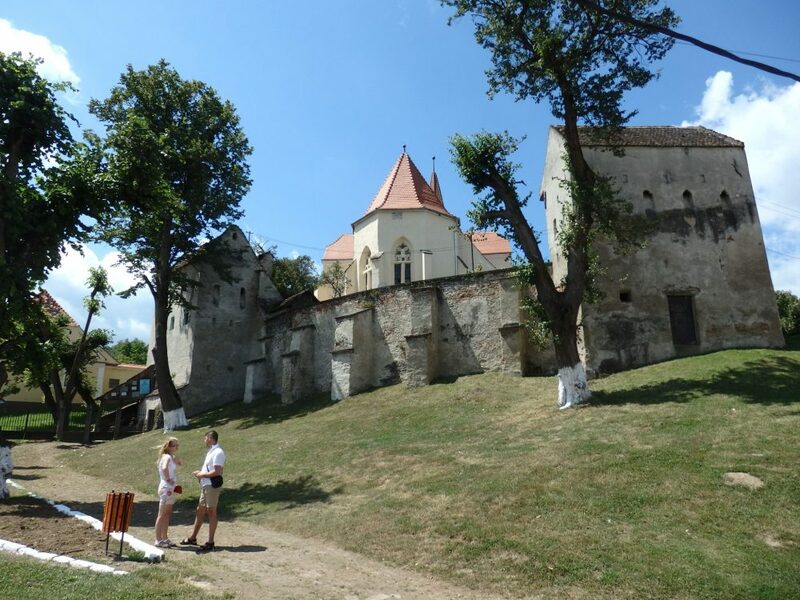 You can also read more about some of the fortified churches on Romania Tourism’s website. The only practical way to visit the fortified churches is by car, or else to sign up for a guided tour that includes transportation. 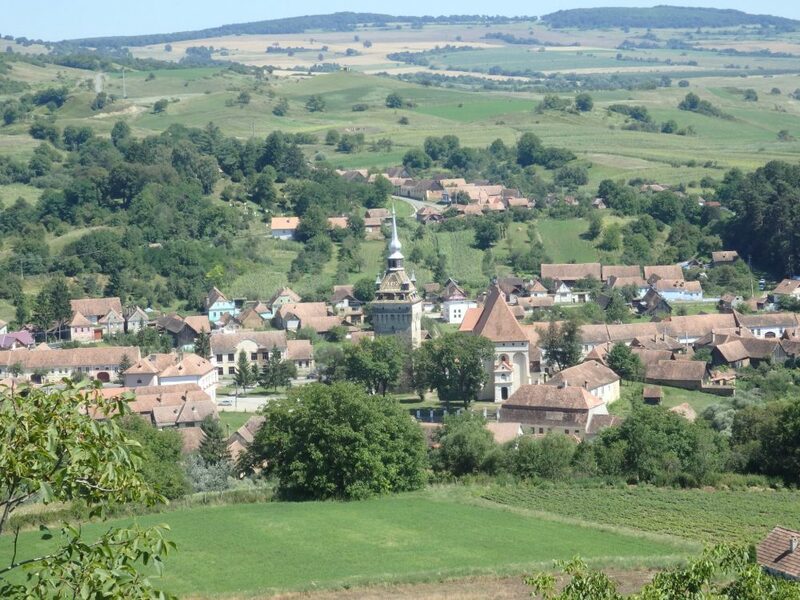 Prejmer is located about 11 miles NE of Brasov. Open May-Oct. Tues-Fri. 9-12 and 1-5; Sat. 9-3 and Sun. 11-3. Open Nov.-Apr. Tues.-Sun. 9-3. . Closed on Monday. Admission 8 lei (less than €2). Viscri is located 25 miles SE of Sighisoara. Open Mon.-Sun. 10-1 and 3-6. Admission 5 lei (about €1). Your article is so interesting. I would love to follow in your footsteps; my kind of adventure!! 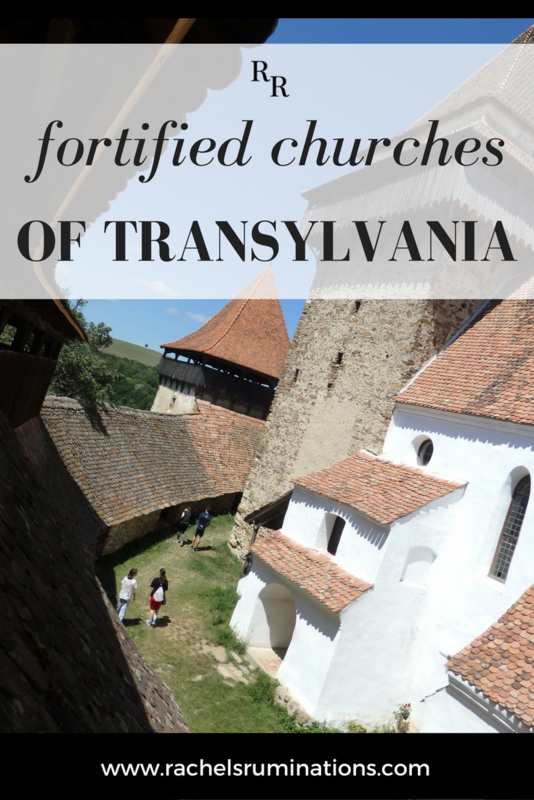 Thx so much for this fabulous post on the fortified churches of Transylvania, Rachel. I would definitely enjoy exploring Romania. We had them pretty much to ourselves. 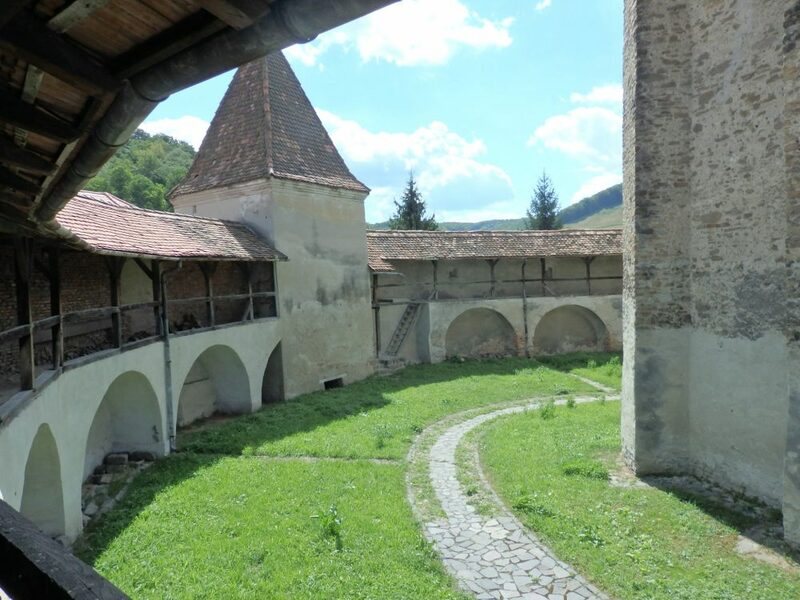 We also visited two other church collections in Romania (painted churches in Moldavia and wooden churches in Maramures) that are UNESCO listed and pretty much ignored! Bear in mind that these areas don’t have highways, so travel in the northern half of Romania can be quite slow. Super pictures. I loved looking at your pictures. I felt I was in Transylvania. Great story too. I guess I can understand why churches might need to be fortified (then and now). I do like the interior floral decoration. I do not think I would have recognised several of the churches in your photos as churches. I know right? They look like little castles! Love a good history lesson and even better to walk through history as you’ve done. I can’t believe how much you did in two days. I loved this region. The Saxon influence gives it such a charming appeal. Go for it! These churches are all different and interesting, and the countryside in the northern half of Romania is beautiful! It’s interesting that churches were used as fortresses because I normally assume that they were sanctuaries that invaders were loathe to attack. (Not quite sure where I got that idea. The movies?) I think that I’d like exploring these places and seeing the towns near them. I also didn’t know that Saxons were from what is now Transylvania. No, the Saxons were Germans, and, if I got the history right, they were sent by the King of Hungary to settle in Romania. They built churches, then built the fortifications around them and/or made their towers defensible. 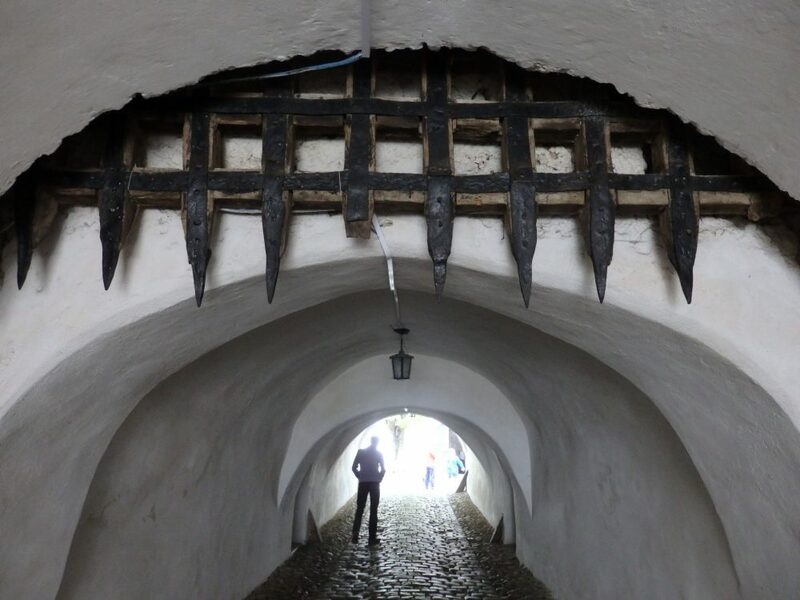 You’ve certainly made it easy for someone to follow in your footsteps and visit the fortified churches of Transylvania, although that first gate is more than a little intimidating! I especially liked the painted walls of Bunesti. 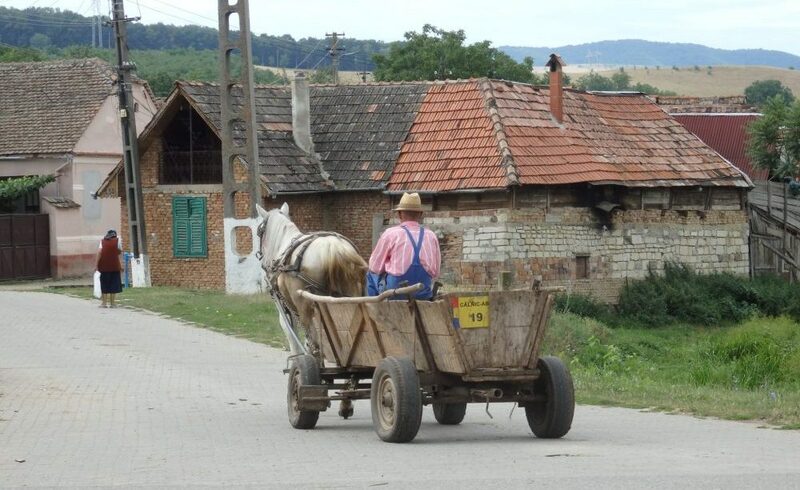 I like off the beaten path destinations and this certainly looks like a charming area of Romania. Great article with lots of information and beautiful pictures! Romania sounds like a great place.I’ve not heard of such a thing as fortified churches before Rachel!